LOS ANGELES — Pacific Gas and Electric, the largest electric utility in California, filed for bankruptcy protection on Tuesday in anticipation of billions of dollars in liability claims for two years of wildfires. Investors and state officials tried to persuade the company’s board to change its plans over the last several days by offering alternative proposals and ideas. Some of those people seized on a finding last week by state investigators that PG&E did not cause the Tubbs Fire, which tore through Sonoma County in 2017 and was the second-worst fire in California history. They were hoping that the finding had reduced PG&E’s liabilities enough to make the bankruptcy unnecessary. Public interest groups, lawyers for wildfire victims and some investors have opposed PG&E’s bankruptcy filing. They fear that it could result in higher electricity rates and make it more difficult for residents to receive compensation for their losses. BlueMountain Capital Management, one of PG&E’s major investors, said in a statement that the bankruptcy filing was “reckless and irresponsible” and called for replacing the company’s board of directors. But by the start of this week, many investors and state officials appeared resigned to the company’s filing. 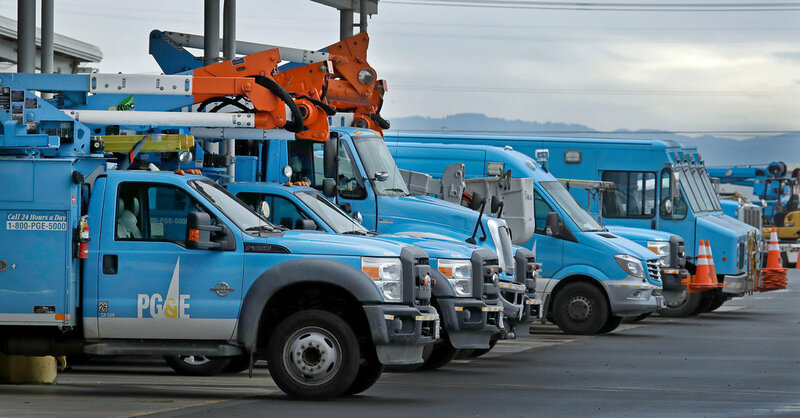 The California Public Utilities Commission held an emergency meeting Monday afternoon to give its approval to PG&E’s plan to borrow $5.5 billion to finance itself over the next two years while it is in bankruptcy. The California Public Utilities Commission, which regulates PG&E and the state’s other investor-owned utilities, is reviewing possible changes to the utility that include selling part of the company or turning it into a government-run operation. The International Brotherhood of Electrical Workers Local 1245, a union that represents 12,000 PG&E employees, said it opposed any breakup of the company. “Parceling out the utility into smaller, weaker segments would unquestionably have a negative impact on the safety and stability of both gas and electric service, it would increase costs, and it would decelerate progress toward California’s ambitious clean energy goals,” Tom Dalzell, the union’s business manager, said in a statement. As part of the filings, PG&E asked the court to allow it to continue paying employee wages and providing health care and other benefits. PG&E is also seeking to maintain its customer programs, including support for low-income customers and the promotion of clean or more efficient energy practices. The company says it intends to pay suppliers in full. The utility expects court decisions on those requests in the coming days. Next PostNext Can Technology Help Fix the Housing Market?